The Pre-Socratic Philosophers and the Teachings Ascribed to Them. It is absolutely necessary here in chapters V and VI to mention the doctrines of the so called Greek philosophers in order to convince my readers of their Egyptian origin which is shown in the summaries of conclusions which follow these teachings. It is also necessary to mention them so as to serve the purpose of reference and to meet the convenience of readers. I. The Earlier Ionian School. This Group consisted of (i) Thales (ii) Anaximander and (iii) Anaximenes. (a) water is the source of all living things. (b) all things are full of God. Both history and tradition are silent as to how Thales arrived at his conclusions, except that Aristotle attempts to offer his opinion as a reason: that is that Thales must have been influenced by the consideration of the moisture of nutriment, and based his conclusion on a rationalistic interpretation of the myth of Oceanus. This however is regarded as mere conjecture on the part of Aristotle. (Turner's History of Philosophy, p. 34). (ii) Anaximander, supposed to have been born 610 B.C. at Miletus, is credited with the teaching that, the origin of all things is "the Infinite", or the Unlimited (i.e., apeiron), or the Boundless. The Apeiron is regarded as equivalent to the modern notion of space, and the mythological notion of chaos. Both history and tradition are silent as to how Anaximander arrived at his conclusion: but here again we find Aristotle offering his opinion as a reason, i.e., that Anaximander must have supposed that change destroys matter, and that unless the substratum of change is limitless, change must at sometime cease. This opinion, is of course, mere conjecture, on the part of Aristotle. (Turners History of Philosophy, p. 3536). (iii) Anaximenes, also a native of Miletus, and supposed to have died in 528 B.C., is credited with the teaching that all things originated from air. Both history and tradition are silent as to how Anaximenes arrived at his conclusion; and all attempts to furnish a reason are regarded as mere conjecture. (Turner's History of Philosophy, p. 37–38). (i) Transmigration, the immortality of the soul and salvation. This salvation is based upon certain beliefs concerning the soul. True life is not to be found here on earth, and what men call life is really death, and the body is the tomb of the soul. Owing to the contamination caused by the soul's imprisonment in the body, it is forced to pass through an indefinite series of re-incarnations: from the body of one animal, to that of another, until it is purged from such contamination. Salvation, in this sense, consists of the freedom of the soul from the "cycle of birth, death and rebirth", which is common to every soul, and which condition must remain until purification or purgation is completed. Being liberated from the ten chains of the flesh, and also from successive re-incarnations, the soul now acquires her pristine perfection, and the eligibility to join the company of the Gods, with whom she dwells for ever. This was the reward which the Pythagorean System offered its initiates. (ii) The doctrines of (a) Opposites, (b) the Summum Bonum, or Supreme Good, and (c) the process of purification. (a) THE UNION OF OPPOSITES creates harmony in the universe. This is true in the case of musical sounds, such as we find in the lyre: where the harmony produced is the result of the mean proportional relation between the length of the two middle strings to that of the two extremes. This is also true in natural phenomena, which are identified with number, whose elements consist of the odd and the even. The even is unlimited, because of its quality of unlimited divisibility, and the odd indicates limitation; while the product of both is the unit or harmony. Similarly, do we obtain harmony in the union of positive and negative; male and female; material and immaterial; body and soul. (b) THE SUMMUM BONUM OR SUPREME GOOD in man, is to become godlike. This is an attainment, or transformation which is the harmony resulting from a life of virtue. It consists in a harmonious relationship between the faculties of man, by means of which his lower nature becomes subordinated to his higher nature. of the intellect through the pursuit of scientific knowledge and strict bodily discipline. In this process, music also held an important place. The Pythagoreans believed and taught that just as medicine is used to cure the body, so music must be used to cure the soul. 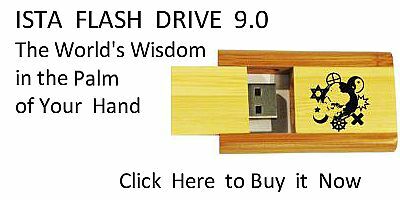 "Mankind is divided into three classes: Lovers of wealth; lovers of honour, and lovers of wisdom (i.e. philosophers); this last, being highest." According to Pythagoras, philosophy determined the purification, which led to the final salvation of the soul. All things are numbers, that is to say not only every object, but the entire universe is an arrangement of numbers. This means that the characteristic of any object is the number by which it is represented. (a) Since the universe consists of ten bodies, namely, the five stars, the earth and the counter earth, then the universe must be represented by the perfect number ten. (b) Applied to the space around us, but called by Pythagoreans the Boundless or Unlimited, it must be taken to mean, the measuring out of this Boundless, into a balanced and harmonious universe, so that everything might receive its proper proportion of it. No more, no less. (c) This arrangement seems to suggest the notion of forms capable of receiving a mathematical expression, i.e., a doctrine which later appeared in Plato, as the theory of Ideas. their spheres, revolve from West to East, while around all there is the peripheral fire. This motion of the heavenly bodies is regulated in the velocity, and produces the harmony of the spheres. (Roger's Students' History of Philosophy p. 14–22). (Bakewell's Source Book of Philosophy) (Life and Tenets of Pythagoras). (Ruddick's History of Philosophy) (Life and Tenets of Pythagoras). (Fuller's History of Philosophy) (Life and Tenets of Pythagoras). (Turner's History of Philosophy: p. 40–43). (Aristotle's Metaphysics I 5; 985b, 24; and I 5; 986a, 23). The Eleatic Philosophers include (a) Xenophanes, (b) Parmenides, (c) Zeno and (d) Melissus. They deal with the problem of change, and are credited with introducing the notions of Being and Becoming. The term Eleatic is derived from Elea, a city in Southern Italy, where these men are said only to have visited. Men err when they ascribe their own characteristics to the gods: for God is all eye, all ear, and all intellect. Again, since there is no Becoming, and since Plurality depends upon Becoming, therefore there is no Plurality. Consequently all is one and one is all. Against the artificial culture of Greece, its luxuries, excess and fops; Xenophanes is credited with advocating Temperance i.e., plain living, simplicity, moderation, and pure thinking. Roger's Students' History of Philosophy: p. 27–28. Wm. Turner's History of Philosophy: p. 45–46. Zeller's History of Philosophy: p. 58–60. Is said to have been born at Elea 540 B.C. and to have composed a poem concerning nature: peri physeos, which contains his doctrines. (i) In part one, the Goddess of truth points out that there are two paths of knowledge: one leading to a knowledge of truth, and the other to a knowledge of the opinions of men. (ii) In part two, the journey to truth is described and contains a metaphysical doctrine, and in part three, a cosmology of the apparent. Though right reason (logos) holds that Being is one and immutable, the senses and common opinion (doxa) are convinced that plurality and change exist around us. (ii) The Doctrine of Truth. Truth consists of the knowledge that Being is, and that not-Being is not: and since not-Being is,not, then Being is one and alone. Consequently, Being is unproduced and unchangeable. It is impossible for Being to produce Being; for under such circumstances Being must exist before it begins to exist. (iii) The doctrine of the Cosmology of the Apparent. All things are composed of light or warmth, and of darkness or cold, and according to Aristotle, the former of these opposites corresponds to Being, while the latter to not-Being. These opposites are equivalent to the male and female principles in the cosmos. (iv) The Doctrine of the Anthropology of the Apparent:—The life of the soul, i.e., perception and reflexion, depends upon the blending of opposites, i.e., of the light-warm and the dark-cold principles, each of which stands in a physical relation to a corresponding principle in the cosmos. (Zeller's History of Philosophy p. 60–62). (Roger's Students' History of Philosophy p. 29–30). (William Turner's History of Philosophy p. 47–48). (B. D. Alexander's History of Philosophy p. 22–24). Supposed to be born 490 B.C. at Elea was a pupil of Parmenides, according to Plato. (Parmenides 127B). His doctrines were intended to be a contradiction of (i) Motion and (ii) Plurality and space. (a) A body, in order to move from one point to another, must move through an infinite number of spaces since magnitude is divisible ad infinitum. (b) A body which is in one place is at rest. An arrow in its flight, is at each successive moment in one place therefore it is at rest. will have gained more ground. Since Achilles must always reach first the position previously occupied by the tortoise, the tortoise must always keep ahead, at every point. (c) If magnitude exists, it must be infinitely great and infinitely small, at one and the same time, since it has an infinitude of parts which are indivisible. Therefore the idea of the manifold is contradictory. (William Turner's History of Philosophy p. 49–50). (Roger's Students' History of Philosophy p. 31–32). (Zeller's History of Philosophy p. 63–64). 4. The Later Ionian School: (a) Heraclitus, (b) Anaxagoras, (c) Democritus. There is no static Being, and no Unchanging element. Change is Lord of the Universe. The underlying element of the universe is Fire, and all things are changed for Fire, and Fire for all things. only to go through a similar process as they ascend again into Fire. (b) It contains the elements both of the old and new, at any given moment in the process. Consequently, where night ends, there day begins; where summer begins, there spring ends; and where mortal life ends, there spiritual life begins. (c) It also consists in the generation which results from the union of opposites (a doctrine, later to be found in Plato and Socrates). Hence we observe that the union of male and female produces organic life; and that sharp and flat notes produce harmony. Since sense-knowledge, or knowledge derived from the senses is illusion, it must be avoided, and true knowledge sought for in the perception of the underlying unity of the various opposites. This is possible for man, who is part of the all comprehending Fire, which underlies the Universe. But in the doctrine of the upward and downward paths, true knowledge comes from the upward path which leads to the eternal Fire; whereas folly and death are the result of following the downward path. That the hidden harmony of nature ever reproduces concord from oppositions, that the divine law (dikē) or universal reason (logos) rules all things; and that the primitive essence recomposes itself anew in all things according to fixed laws, and is again restored by them. (Zeller's History of Philosophy p. 68). (A. B. Turner's History of Philosophy p. 66–77). (Zeller's History of Philosophy p. 66–71). (William Turner's History of Philosophy p. 53–58). Anaxagoras, a native of Clazomenae, in Ionia, is supposed to have been born in 500 B.C. Like all the other philosophers, nothing is known about his early life and education. He comes into history through a visit to Athens, where he met and made the friendship of Pericles, and where he was charged with impiety. He however escaped from prison and fled back to his home in Ionia where he died in 430 B.C. (i) Nous i.e., mind alone is self-moved, and is the cause of motion in everything in the universe, and has supreme power over all things. (William Turner's History of Philosophy, p. 63); (Zeller's Hist. of Phil. p. 85; 86). (ii) Sensation is produced by the stimulation of opposites. We experience the sensation of cold, because of the heat in us, and we experience a sweet taste because of the sour in us. (Wm. Turner's Hist. of Phil. p. 64; Theophrastus: de Sensu, Fragment 27: Zeller's Hist. of Phil. p. 86). These doctrines will be treated elsewhere, as regards their source and authorship. Democritus (420–316 B.C.) is said to have been the son of Hegesistratus, and also a native of Abdera, a city at Miletus, an island in the Aegean. Both Aristotle and Theophrastus have regarded Leucippus as the founder of atomism, in spite of the fact that his existence is doubted. Like all the other Greek philosophers, nothing seems to be known about his early life and training. However he enters history as a magician and sorcerer. (Burnet, op. cit. p. 350; Wm. Turner's Hist. of Phil. p. 65). (a) The world-stuff. The atom is explained as a colorless, transparent and homogeneous powder, consisting of an infinite number of particles. (b) Their Qualities: The atom is described as full or solid, invisible, indestructible, un-created and capable self-motion. The atoms differ in shape, order, position, quantity and weight. (c) The Identity of the Atom with Reality: Every atom is equivalent to "that which is (i.e. To on); and the void is equivalent to "that which is not" (i.e., To mē on). Reality is the movement of "that which is," within that-which is not. (ii) The Atom in Creation. Owing to the difference in size, weight and mobility, and in particular to necessity, there is a resultant motion, by means of which the atoms combine themselves for the formation of the organic and inorganic worlds. (iii) The Atoms in the Phenomena of Life and Death. What we commonly call life and death, are due to a change in the arrangement of the atoms. When they are arranged in a certain way, life emerges; but when that arrangement is changed to another way, then death is the result. In death, the personality disappears, the senses also disappear; but the atoms live on for ever. The heavier atoms descend to the earth: but the soul atoms, which are composed of fire, ascend to the celestial regions, whence they came. (a) The Mind or Soul is composed of fire atoms, which are the finest, the smoothest, and the most mobile. These fire atoms are distributed throughout the whole universe; and in all animate things, and especially in the human body, where they are found in the largest numbers. (b) External objects constantly give off emanations or minute images of themselves. These in turn impress themselves upon our senses, which set in motion our Soul atoms, and thereby create Sensation and Knowledge. (Diogenes Laertius Book IX p. 443–455). (Wm. Turner's History of Philosophy p. 65–70). (Roger's Students History of Philosophy p. 40–42). (Zeller's History of Philosophy p. 76–83). (B. D. Alexander's History of Philosophy p. 37–41). 5. Summary of Conclusions Concerning the Pre-Socratic Philosophers and the History of the Four Qualities and Four Elements. of teaching the following doctrines (a) Thales, that all things originated from water, (b) Anaximander, that all things originated from Primitive matter, i.e., the boundless (to apeiron), and (c) Anaximenes, that all things get their life from air. But these ideas were not new at the time when these men are supposed to have lived, i.e., between the sixth and fifth centuries B.C. The creation story, found in the book of Genesis, speaks of the elements of water, air and earth as the cosmic ingredients of the chaos out of which creation gradually developed. The date of the Pentateuch is placed at the eighth century B.C. ; but the view of the Mosaic authorship of Genesis takes us still further back into antiquity, and many centuries before the time of the Ionian philosophers. We are told not only by the bible, but also by the historian Philo, that Moses was an Initiate of the Egyptian Mysteries and became a Hierogrammat; learned in all the wisdom of the Egyptian people. This was only possible by proper initiation and gradual advancement, when evidence of fitness was demonstrated by the Neophyte. The Egyptian name of Moses was given to all candidates at their baptism, and meant "saved by water". The Exodus of the Israelites appears to have occurred in the 21st Egyptian Dynasty, i.e., 1100 B.C. in the reign of Bocchoris under the leadership of Moses, whose creation story of Genesis is clearly of Egyptian origin. It is clear that the early Ionic Philosophers drew their teachings from Egyptian sources. (Chaeremon: Jos. C. Apion I, 32; Philo; Ancient Mysteries C. H. Vail p. 61; John Kendrick's Ancient Egypt vol. 2 p. 268–270; 303; See also Dr. Hasting's Bible Dictionary, on authorship and date of Pentateuch). absurdum. Parmenides introduced no new teaching when he spoke of Being (To on) as that which exists; and Non-Being (To mē on) as that which does not exist. He only reemphasized the doctrine of opposites as a principle of nature: a doctrine taught not only by the Pythagoreans, but also the Athenian philosophers, chiefly Socrates. But the doctrine of opposites owes its origin to the Egyptian Mysteries which take us back to 4000 B.C. when it was demonstrated not only by double pillars in front of temples, but also by the pairs of Gods in the Mystery System, representing male and female, positive and negative principles of nature. It is also clear that the Eleatic Philosophers drew their teachings from Egyptian sources. (Plato Phaedo; Memphite Theology: Intellectual Adventure of Primitive Man by Frankfort p. 55; 66–67; 51–60. Plutarch: Isis et Osiris, p. 364C; 355A; 371B; 868, Ancient Egypt: John Kendrick vol. I p. 339). (1) Heraclitus, (a) that the world was produced by fire through a process of transmutation, and (b) since all things originate from fire, then Fire is the Logos: The Creator. (2) Anaxagoras (a) the Nous or mind is the source of motion or life in the universe and that sensation is produced by the stimulation of opposites. (3) Democritus (a) that atoms under-lie all material things, and (b) that the phenomena of life and death are merely changes in the mixture of the atoms, so that the atoms never die, because they are immortal. goes back to something like 3300 B.C., several thousands of years before the Greeks were said to have come into the Mediterranean area. According to Jamblichus the Egyptian God Ptah was the God of order and form in creation, an Intellectual Principle. This God was also recognized as the Divine Artificer who fashioned the universe out of fire. Rosellini: mon del sults; John Kendrick's Ancient Egypt vol. I p. 318. Furthermore, Swinburne Clymer in his Philosophy of Fire p. 18 has made the following statement "The study of the Mysteries of Isis and Osiris (Egyptian Goddess and God) quickly proves to the student that it was a pure Fire Philosophy. Zoroaster carried those mysteries into Greece, while Orpheus carried them into Thrace. In each of these places, these Egyptian mysteries assumed the names of different Gods in order to be adapted to local conditions. Hence in Asia they took the form of Mithra: in Samothrace, the form of the Mother of the Gods; in Boeotia, the form of Bacchus; in Crete, the form of Jupiter; in Athens, the forms of Ceres and Proserpine. The most noted of these Egyptian imitations were the Orphic, Bacchic, Eleusinian, Samothracian, and Mithraic. All of these Fire Worshippers, believed that the universe originated from Fire, and they lived at a time which antedated the time of the late Ionic philosophers by thousands of years. The other doctrines of the later Ionic philosophers together with those of Socrates, Plato and Aristotle will be treated under Summaries of Socrates, Plato and Aristotle and in Chapter VIII, and will include (1) Opposites (2) The nous or mind (3) The Logos, (4) The Atom, (5) The Theory of Ideas, (6) The Unmoved Mover, (7) Immortality. IV. The Greek Philosophers practised plagiarism. 1. The Doctrine of Opposites: the unit of number is composed both of odd and even elements; of the finite and infinite; and of the positive and negative. In this connection, we find (a) Heraclitus suggesting fire to be the source of creation, by means of the principle of strife which separates phenomena; and harmony which restores them to their original source. (William Turner's History of Philosophy p. 55; Zeller's Hist. of Phil. p. 67–68). (b) Parmenides, suggesting Being as existent and Non-Being as non-existent (Zeller's Hist. of Phil. p. 61; Turner's Hist. of Phil. p. 48). (c) Socrates, attempting to prove the immortality of the Soul by the doctrine of opposites (Plato Phaedo). (d) Plato, attempting to explain nature, used the Theory of Ideas which he based upon the principle of opposites. Consequently the Idea is true reality, i.e., Being (To on); hence the concept is real; but the thing which is known by the concept is unreal. The noumen is real and perfect; but the phenomenon is unreal and imperfect (Parmenides 132D; Aristotle Meta 16, 987b9). (e) Aristotle in attempting to establish the existence of God, describes the divine attributes in terms of opposites. God is the First Mover that is unmoved (proton kinoûn akineton). Hence, we have a combination of motion and rest, as the attributes of Deity and Nature. (Aristotle's physics VIII 5, 256a; II 1; 192b 14; II 8, 199; de caelo I 4, 271a; Wm. Turner's Hist. of Phil. p. 141). 2. The Doctrine of Harmony, as a union of opposites, after being expounded by Pythagoras, appears also in the systems of (a) Heraclitus, who explains the phenomena of nature as passing successively through their opposites; (b) Socrates, who also defines harmony as the union of opposites; (c) Plato, who defines the harmony of the soul as the proper subordination of its parts, i.e., the higher and lower natures. (Turner's Hist. of Phil. p. 41; 56; Zeller's Hist. of Phil. p. 51; 69; Plato Phaedo C 15; Plato Republic); also (d) Aristotle, who defines the soul as a harmony in his de animo I. 2. 3. The Central and Peripheral Fires. Here Pythagoras attempts to show that fire under-lies creation, and this same notion is expressed by (a) Heraclitus, who speaks of the origin of the universe through the transformation of fire. Then we have (b) Anaxagoras (c) Democritus (d) Socrates and (e) Plato, each using the term mind (nous) as responsible for creation. Anaxagoras and Socrates who speak directly of mind (nous) as an Intelligence and purpose behind nature; while Democritus and Plato speak of mind (nous) indirectly as the World Soul, but further describe it as being composed of fire atoms floating throughout space. Clearly then, Mind (nous), no matter what other name or function we give it, is fire, since it is composed of fire atoms; and fire according to Pythagoras underlies creation. (Wm. Turner's Hist. of Phil. p. 42, 55, 63, 82; Zeller's Hist. of Phil. p. 53, 67, 76–83; Aristotle: Metaphysics I, 3, 984b, 17; Diogenes Laertius: Bk. X. p. 443–453; Xenophon Memorabilia I, 4, 2; Plato Timaeus: 30, 35; Roger's Student Hist. of Phil. p. 40–42; B. D. Alexander's Hist. of Phil. p. 43). finally attains the consummation of unity with God. (Zeller's Hist. of Phil. p. 50–56; Roger's Hist. of Phil. p. 29 and 60; William Turner's Hist. of Phil. p. 41 and 48). B. Plato's doctrines (1) Transmigration and (2) Recollection: (1) Transmigration: the souls of men go to the place of reward or punishment, and after one thousand years they are permitted to choose a new lot of life. He who has thrice chosen the higher life, gains after three thousand years, the home of the Gods in the kingdom of thought. Others wander about for thousands of years in various bodies; and many are destined to pursue their earthly life in lower animal forms. It is necessary to point out that in this doctrine of Transmigration, Plato describes the judgement scene in the Egyptian Book of the Dead. (2) Recollection: although the sense perceived world cannot lead us to a knowledge of Ideas, yet it reminds us of the Ideas which we saw in a previous existence. (The allegory of the Subterranean Cavern; Plato's Republic C. X; The Allegory of the slave boy; Plato's Meno; Timaeus of Plato: 31B, 33B; 38E; The Phaedo of Plato: C 15; 29; 57; Wm. Turner's Hist. of Phil. P. 105–112; B. D. Alexander's Hist. of Phil. p. 55; 152–153). and according to C. H. Vail in his Ancient Mysteries, the Egyptian Summum Bonum consisted of five stages, during which the Neophyte developed from a good man into a triumphant Master, attaining the highest spiritual consciousness by means of casting off the ten bodily fetters and becoming an adept like Horus or Buddha or Christ). The philosophers, besides Pythagoras, who are given credit with having taught the doctrine of the Supreme Good, are (a) Socrates, who defined it as an attainment in which man becomes godlike, through self-denial and the cultivation of the mind. (Xenophon Memorabilia I, 5, 4,) (b) Plato who defined it as happiness which is the attainment of the Idea of the Good, which is God. (Plato: Symposium 204E; Plato: Republic IV, 441, 443; Plato: Phaedo 64 sqq; Plato: Theaetetus 176 A). (c) Aristotle; who defined it as happiness which is based upon reason and which includes all the gifts of fortune. It should be noted however that Aristotle's definition of the Supreme Good marks the first departure from the concept of the Summum Bonum of the Egyptian Mysteries; and the same thing is true of the Hedonists, who defined it as pleasure. (Wm. Turner's Hist. of Phil. p. 153. Aristotle Ethics, Nic I, 6, 1097; Aristotle Ethics, Nic I, 9, 1099a, 31) The conception of a Supreme Good is Egyptian, from which source Pythagoras and other philosophers obtained the doctrine. Because of the importance of the doctrine of the atom, and the great suspicion of his great number of books like that of Aristotle, Democritus is treated separately, like each of the Athenian philosophers. life and training. However he comes into history attracting public attention, as a sorcerer and magician. (Turner's Hist. of Phil. p. 65). (i) Authorship: The authorship of the doctrine of the atom is doubtful, from the standpoint or view of certain modern writers. The names of the Ionians Leucippus and Democritus have been associated with this doctrine, which according to the opinion of Aristotle and Theophrastus, originated through Leucippus, but was developed by Democritus. As a matter of fact, the Ionians doubted the existence of Leucippus because he was unknown to them; and it seems proper that the opinion of the Ionians should receive credence rather than that of Aristotle and Theophrastus, who were Athenians, and who were compiling philosophy in the interest of their movement. (Burnet op. cit. p. 350; Turner's Hist. of Phil. p. 65). (ii) The doctrine concerning the Atom is eclectic. The doctrine of the atom as explained by Democritus, is eclectic, and represents one of the many forms in which the ancient doctrine of opposites has been expressed. The Pythagoreans expressed it by the elements of number: odd and even. Parmenides being unfamiliar with the law of generation, denied the existence of one opposite (not-Being), in order to affirm the existence of the other (being). Socrates, being more acquainted with the law of generation than Parmenides, expressed it in several pairs of opposites, in an effort to prove the immortality of the soul: hence he spoke of unity and duality; of division and composition; of life and death. In like manner Democritus expressed the doctrine of opposites, when he described Reality by the life of the atom, i.e., a movement of "that which is" (To on) within "that which is not" (To mē on). The original source of this doctrine however, is the philosophy of the Mystery System of Egypt where we find the male and female principles of nature symbolized by (a) Osiris and Isis: the Egyptian God and Goddess, and (b) the Gods Homs and Seth, symbolizing a world in static equilibrium of conflicting forces, as they contend for dominion over Egypt. (Memphite Theology; Kingship and the Gods by Frankfort C. 3, p. 25–26; 35; Herodotus I, 6–26; Ancient Egypt by John Kendrick Bk. I p. 339; Egyptian Religion by Frankfort, p. 64, 73 and 88; Zeller's Hist. of Phil. p. 61; Wm. Turner's Hist. of Phil. p. 41; Plato Phaedo C. 15, 16, 49). (b) Huk and Hauket i.e., Illimitable and the Boundless. (d) Amon and Amaunet, i.e., the hidden and concealed ones (the Air, Wind). Clearly the doctrine of opposites was a basic philosophy of the Egyptians, being connected with not only the Gods of their Mystery dramas, but with their Cosmology, and since this connection makes the doctrine one of the earliest in the development of Egyptian thought, it antedates the reign of Menes, and means that the Egyptians were familiar with it before 3000 B.C. [paragraph continues] (a) of the atom and (b) of opposites. Leucippus and Democritus taught nothing new and must have obtained their knowledge of the doctrines from the Egyptians, directly or indirectly. These doctrines are magical and express the magical principle "that the qualities of animals or things are distributed throughout all their parts." (Dr. Frazer's Golden Bough). Consequently within the universe contact is established between objects through emanations, and in the case of human beings, the result might be sensation or cognition; healing or contagion. This principle is demonstrated not only by the cures such as were affected by the garment of Christ, and the handkerchiefs of St. Paul: but also by the modern scientific and medical practice of the preventive measure of quarantine. It must be remembered that magic was part of the education of the Egyptian priests: for the religious rites and ceremonies of the Egyptians were magical; and the priests were the custodians of the knowledge. (iv) A fourth point is the fact that in the history and compilation of Greek philosophy by Aristotle and his followers, there are only two men whose names are associated with the authorship of an extraordinary number of scientific books; and the names of these men are Democritus himself and Aristotle. (Diogenes Laertius Bk. 9 p. 445–461; Bk. 5 p. 465–467). [paragraph continues] Greek philosophy by Aristotle and his followers, it has been discovered that wherever there has been the possession of a large collection of scientific books, there has also been direct or indirect association with Alexander the Great. (vi) The association between Democritus and Alexander the Great is seen through the Democritean Circle; a succession of Teachers and students, from a common original Teacher:—Democritus (420–316 B.C.) is said to have taught Metrodorus of Chios, who in turn is said to have taught Anaxarchus, who is said to have flourished at the time of the 110th Olympiad (340–337 B.C. ), and to have accompanied Alexander the Great on his campaign against Egypt 333 B.C. Here, it is easy to see the tie between Democritus and Anaxarchus for these men were all Ionians, and members of the same school and were alive at the time of Alexander's Conquest of Egypt. (Zeller's Hist. of Phil. p. 83; Diogenes Laertius Bk. 2, p. 471). On the other hand, Aristotle's contact with Alexander the Great is well known, since he was a tutor of the young prince, at the Macedonian palace. Roger's Student Hist. of Phil. p. 104). (a) Leucippus, whom the Ionians did not know, and whose existence has been questioned, has been given credit by Aristotle for the origin of the doctrine of the atom. (Zeller's Hist. of Phil. p. 77; Burnet, op. cit. p. 350) (Wm. Turner's Hist. of Phil. P. 65; Diogenes Bk. X, 13). (b) Apart from what was written on the Atom, the name of Democritus is, associated with a large list of books, dealing with over sixty different subjects, and covering all the branches of science known to the ancient world. In addition to this vast field of knowledge, the list also contains books on Military Science, Law and Magic. Clearly, the accumulation of such a vast range of knowledge, by a single individual, written in a single lifetime is impossible both physically and mentally. The method among the ancients of imparting knowledge was by gradual stages, followed by evidence of proficiency, which in turn was also followed by initiations, which marked every step in the progress of the Neophyte. The progress of training was slow and no Neophyte could accomplish such knowledge in his life time as took the Egyptians over five thousand years to accumulate. These human limitations are as true today as they were among the ancients; for our great scientists of the Modern World are specialists only in single subjects. were Ionians, who belonged to the same school and (d) Anaxarchus accompanied Alexander the Great on his campaign against Egypt. ( The indirect association between Democritus and Alexander the Great now becomes obvious.) (e) It follows that since Alexander's conquest of Egypt had brought the Greeks their long hoped for opportunity, i.e., access to the Egyptian Library and Museum, we would naturally expect Alexander and his friends, and the invading armies to have helped themselves with the Egyptian books. We would also expect Anaxarchus upon his return to Ionia, to have sold, at least a portion of his loot, to Democritus, (nor do we expect Aristotle and Theophrastus to relate these facts to us), since under the rules of the Mysteries, knowledge (spoken or written,) could be diffused only by brethren among brethren. This we believe is the way Democritus came to possess such a large number of scientific books. Again it must be stated that Democritus taught nothing new, but simply what he had learnt from the Egyptians, directly or indirectly. His doctrine on the universal distribution of fire atoms is based upon a magical principle: if the atom is an ingredient of the world, then it would be universally distributed. training which he must have received from them. (Antisthenes: Treatise on Succession; Herodotus; Origen; Diogenes Laertius: Bk. 9 p. 443; Zeller's Hist. of Phil. p. 77). 3. His Books are doubtful in authorship. (a) A large number of books which appears in a list in the 9th Book of Diogenes, Laertius, does not appear elsewhere in the usual textbooks on the history of Greek Philosophy; while Zeller asserts that the genuineness of these books cannot be determined upon the evidence of the fragments. (Zeller's Hist. of Phil. p. 77). It seems that his list of publications remains doubtful in authorship. (b) More than 60 different subjects are treated and they include Ethics, Physics, Astronomy, Botany, Zoology, Poetry, Medicine, Dialectics, Military Science, and Law; also books on Magic, including divination. (c) We are informed by Diogenes Laertius that this large list of books was compiled by Thrasyllus (about 20 A.D.) who was a student of the school of Plato, and also a member of Aristotle's movement, which had for its purpose, the compilation of Greek philosophy. (Zeller's Hist. of Phil. p. 13–14) (Diogenes Laertius Bk. 9 p. 455–461). VI. The Four Qualities and Four Elements. 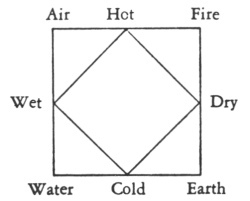 The history of the following ancient theory of "The Four Qualities and Four Elements", provides the world with the evidence of the Egyptian origin of the doctrines of (a) Opposites or Contraries, (b) Change or Transmutation and (c) the life and function of the universe is due to either of four elements: fire, or water, or earth or air. 1. This ancient theory was expressed by a diagram formed by outer and inner squares. 2. The corners of the outer square carried the names of the elements: fire, water, earth and air. 3. The corners of the inner square, being at the mid points of the sides of the outer square, carried the four fundamental qualities, the hot, the dry, the cold and the wet. 4. The diagram explains that fire is hot and dry; earth is dry and cold; water is cold and wet; and air is wet and hot. 5. Accordingly water is an embodiment of cold and wet qualities, and when the cold quality is replaced by the hot quality, the element water is changed into the element air, with the wet and hot qualities. 6. Consequently, transmutation is definitely implied in the teaching of this symbol. 7. It is the oldest teaching of physical science and has been traced to the Egyptians, as far back as 5000 B.C. 8. It shows that Plato and Aristotle (who had been credited with the authorship of this teaching) derived their doctrines or portions of them from the Egyptians. (Rosicrucian Digest, May 1952, p. 175).